Fly-half Dan Biggar says Wales are determined to prove their doubters wrong when they play England in the World Cup at Twickenham on Saturday. The hosts are the bookmakers' favourites for the Pool A match (kick-off 20:00 BST), which will be key to who qualifies for the quarter-finals. 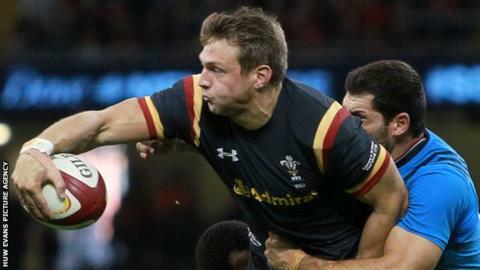 Biggar, 25, says Wales will stay in their "bubble". "We're trying to prove to everyone who has written us off that we've got a good shout in this game," he said. "We know what's at stake, but we are just concentrating on making sure we've got our roles all ticked off and everything else will take of itself. "We're genuinely thinking it's just a game of rugby. It's 15-a-side and the pitch dimensions are the same." England opened their World Cup with a 35-11 bonus-point win over Fiji, before Wales beat Uruguay 54-9 to move top of the group. Saturday's winners will take a major step towards qualifying for the last eight as one of the top-two teams in the pool, although both sides are still to play Australia. England have won the last two meetings with Wales, including a 21-16 victory in Cardiff in the 2015 Six Nations. Fly-half George Ford, man of the match in that game, is on the bench on Saturday with Owen Farrell at 10 and Sam Burgess outside him. Biggar, Wales' goal kicker in the absence of the injured Leigh Halfpenny, accepts that has led to some tactical changes. "We've had a couple of days to get used to that with it being leaked out on Tuesday," added Biggar. "Jonathan Joseph's injury has made them reshuffle a little bit. The two centres they've picked are extremely talented players in terms of physicality, and defensively they're going to be very strong and Owen will strengthen that. "Both Owen and George are superb players and I suppose it was the flip of a coin to decide who got that shirt. "It'll be a physical challenge around that area and we'll just concentrate on our 10, 12, 13 rather than worry about their 10, 12, 13." Six goalscorers, six goal droughts - what is wrong? Read more on Six goalscorers, six goal droughts - what is wrong?